Déjà posté un peu plus bas, mais peut-être y jeter un oeil avec comme point de comparaison Rhizoreality? Peut-être y aurait-il un développement à mettre en commun? L'idée d'un software (OS?) qui aide à faire communiquer les ressources matérielles et digitales (immatérielles) d'une architecture dans le cadre d'un projet est en tout cas commune au deux approches logicielles. At the end of last month, I attended the International Symposium on Electronic Arts (ISEA), that was held in Singapore. Although the juried exhibition of art works didn’t involve that many works on the themes of The Mobile City, the ISEA seminar had quite a few sessions on media technology and the experience of place and space. Unfortunately, there were so many parallel sessions, that I can’t pretend to come even close to a overall wrap-up of the conference. So I will just pinpoint some of the themes and works that I found interesting in a few posts in the next few days or so. If there was one trend that struck me at ISEA, it was probably the idea of data visualization as a way of making abstract or invisible cultural processes more tangible. It wasn’t only the topic of some of the artist presentations, but also the core of Lev Manovich’s inspiring closing talk. The idea is that now that we have more content and metadata than ever (Lev Manovich: this is not the era of ‘new media’ any longer, but rather the era of ‘more media’), interesting cultural forms are emerging from aggregating, analyzing and visualizing this data. Examples range from from simple tag clouds that tell us what people are talking about on the web to visualization of traffic flows in the city and systems that monitor epidemic outbreaks. In business these mappings of aggregated data are called ‘dashboards’. Lev Manovich pointed out that companies have had these dashboards for some time, but that the cultural sector is only now catching up. Right now, these mappings are becoming a new cultural form in themselves. Just look at websites like Visual Complexity , CultureVis, Infosthetics and Information Esthetics. Of course locative and mobile media play an important role in this process. 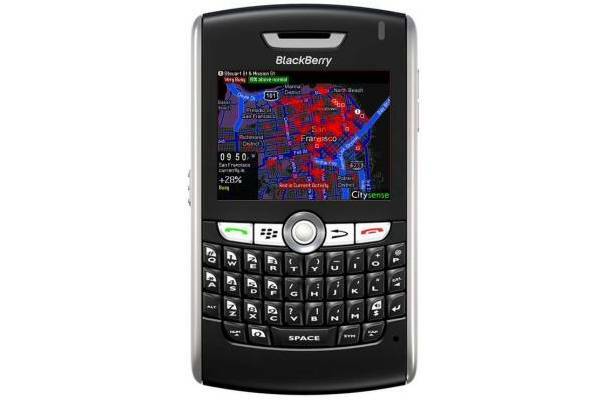 First of all mobile phones are often used as tracking devices. 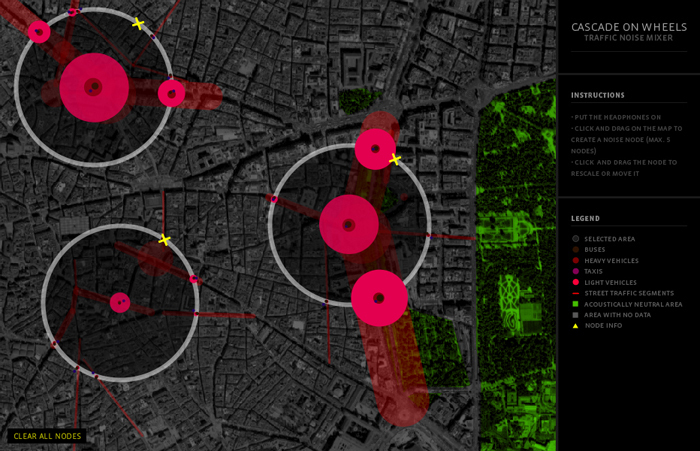 Usage data from mobile phone operators can be used to analyze movement through a city for instance. At the same time, these devices can function as dashboards to their users: mobile phone widgets can show them actual real time analysis of certain social processes in the city. But is not only about mobile devices: these visualizations can become a part of architecture as well, or displayed on urban screens. While all of this is interesting in itself, of course the more interesting question is how to go beyond mere ‘dashboarding’ and mapping of flows? How can we turn these display of statistics in interesting pieced of public art? And how will these maps influence our experience of both the city and our social relationships? Arch-OS was presented by Mike Philips. It is a system that can collects all sorts of data from a building, varying from movement in the building by analyzing the images of cctv camera’s and internet traffic on the LAN to climate data. These data streams can then be used to drive different architectural features, varying from visuals on LED screens to a giant wall sized robot that moves through the open space of an atrium. 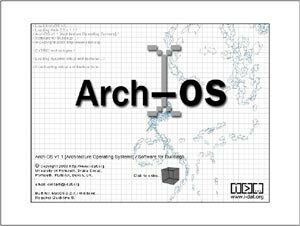 An ‘Operating System’ for contemporary architecture (Arch-OS, ’software for buildings’) has been developed to manifest the life of a building and provide artists, engineers and scientists with a unique environment for developing transdisciplinary work and new public art. Paul Thomas showed his i-500 project, an art work that is part of a new building for Curtin University’s new Minerals and Chemistry Research and Education Buildings. 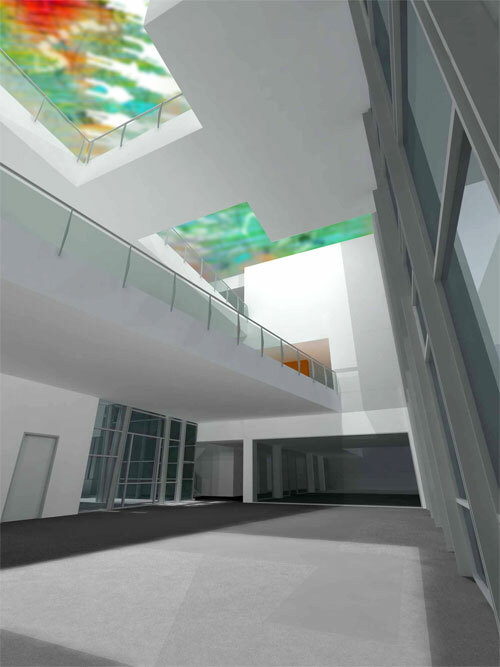 It uses the Arch-Os to analyze the work of the scientists in the building and translates their activity into a public art work that is an integral part of the building. Working in close collaboration with Woods Bagot Architects, as part of the architects project team, the i-500 project team are creating a public artwork to be incorporated into the fabric of the complex with the intention to encourage building users to communicate and collaborate. The i-500 will perform a vital and integral role in the development of scientific research in the fields of nanochemistry (atomic microscopy and computer modeling), applied chemistry, environmental science, hydrometallurgy, biotechnology, and forensic science. The artworks potential is to represent the visualisation of quantitative scientific research as part of the architectural environment. Chris Bowman and Teresa Leung are researching what looked like a ‘grammar of gps visualization systems’. Cabspotting traces San Francisco’s taxi cabs as they travel throughout the Bay Area. The patterns traced by each cab create a living and always-changing map of city life. This map hints at economic, social, and cultural trends that are otherwise invisible. The Exploratorium has invited artists and researchers to use this information to reveal these “Invisible Dynamics. Cascade on Wheels is a visualization project that intends to express the quantity of cars we live with in big cities nowadays. The data set we worked on is the daily average of cars passing by streets, over a year. In this case, a section of the Madrid city center, during 2006. The averages are grouped down into four categories of car types. Light vehicles, taxis, trucks, and buses. The project aggregated data from cell phones (obtained using Telecom Italia’s innovative Lochness platform), buses and taxis in Rome to better understand urban dynamics in real time. By revealing the pulse of the city, the project aims to show how technology can help individuals make more informed decisions about their environment. 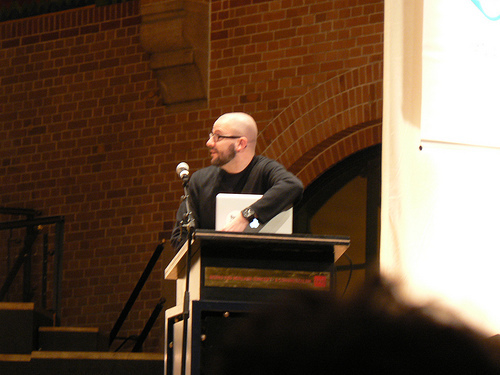 Thursday May 22 2008 I visited the CHI conference The Web and Beyond: Mobility in Amsterdam. Keynote speakers were: Adam Greenfield (Everyware); Jyri Engeström (Jaiku); Ben Cerveny (Playground foundation, Flickr); Christian Lindholm (Fjord, Nokia). I was particularly impressed with Adam Greenfield’s presentation. He had a very rich and dense talk based on the material of the book he is currently working on called “the city is here for you to use”. Below some notes about his talk. Greenfield starts by stating his affiliation with the urbanist tradition of Jane Jacobs and others, who see the city made up of bottom-up processes by ‘ordinary people’. He then described the current state of the city. The (American) city nowadays is characterized by repetition, deliberate attempts to make certain public spaces less attractive to dwell in, and a lot of junk space and privatized commons [although Martijns' recent post shows how these kind of spaces are re-appropriated by kids]. The result, Greenfield says, is a withdrawal of people into mobile phone’s private spaces. The challenge is to overcome these threats to urban life - “the crisis of the American city” - by refinding what constitutes the city in Jacobs’ tradition. Greenfield tries to find that answer in ubiquitous computing. Networked processors are already showing up in new places, on the level of bodies and on the level of the streets. These become social objects. They help create an “ambient informatics”: delivering information locally upon which you can act. This really becomes ambient when information processing dissolves into behavior. Greenfield gives an example of a woman he saw using her transit card in public transport by swinging her handbag in full speed in front of the reader, almost becoming a choreography. Architecture and building is becoming increasingly shaped by computation. It changes the city-scape. It changes mobility too. Objects become accessible, scriptable, queryable, and connected. All this changes the way we use cities from browsing to searching. We can now directly look for something and this search can be customized by recombining elements. Greenfield is somewhat critical of all kinds of informational mapping projects such as the Oakland crime map. People have started to how up at the precinct with such maps demanding more police presence! So are these maps really representing actual risks on the streets, or are they misleading? There are other things more likely to kill you than street crime. Greenfield goes on to talk about “the big now” and “the long here”. He talks about Twitter, and how it is used to become immersed in other places at the same time. This changes city life. Greenfield calls this “The Big Now”. But places are also accessible from multiple other places. Greenfield calls this “The Long Here”: you don’t enter a place, you enter a time. We have to keep in mind that cities are not all the same, but all have their own particularity. We also have to take into account unexpected emerging behavior. These “ambient informatics” objects may be hackable and even used for dangerous/bad ends. 2. Underspecify: do not too much closure to space. 3. Understand changing city life: from flaneur to consumer to user. 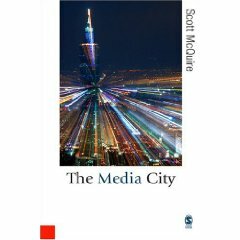 I just finished reading the highly interesting book The Media City by Scott McQuire. It is a philosophical approach to the role of media in the experience of the city. I found two insights worth sharing here. The first is that McQuire sees media not as a means of representation, but rather as a technology that co-constitutes the experience of the city. In other words, what is interesting is not so much how a movie or tv show represents the city. What is interesting is how media can provide new frames for making sense of the city; how it provides new ways of experiencing the city. Second, I liked his approach of technology: McQuire is interested in the way in which new technologies are incorporated into everyday life, how they are turned from ‘disembedding technologies’ into embedded media practices: when new technologies are introduced – be it the telegraph or the internet – they are usually seen as disruptive technologies that will ‘annihilate time and space’ and disembed existing social relations. However, usually after a certain period of time, some of these technologies have become so normal that we do not even notice them anymore. They are so embedded in our everyday practice that we simply can’t imagine what life would be without them. It is the phase in between that is interesting. ‘What may in retrospect seem the logical pathway of future development is not yet inevitable; other possibilities remain open.’ Will these new technologies be applied in a reactionary or in revolutionary way? When looking at locative media and the experience of the city, we might well be in the ‘in between phase’. There is still a lot of bewilderment and excitement about the technologies. Yet clear practices haven’t emerged, although McQuire is critical about the general direction of innovation. It’s mainly pushed by commercial providers aiming at instant gratification for their customer base. There is less attention for usages that might benefit a more public, collective culture. Rather than treating media as something separate from the city – the medium which ‘represents’ urban phenomena by turning it into an image – I argue that the spatial experience of modern social life emerges through a complex process of co-constitution between architectural structures and urban territories, social practices and media feedback. McQuire sees interesting links between this mental frame of understanding the city and developments in other areas. 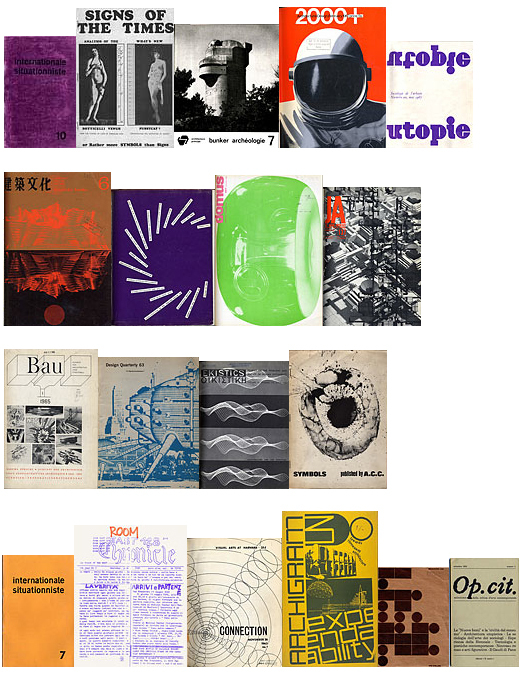 ‘The process [of Hausmanization] is mapped by the seriality of Marville’s images in which various sites become more or less interchangeable losing their unique identities in favour of the more abstract collective idenitity of the set’. At the same time house numbers started to appear, replacing the individual naming of houses that had been dominant until then with an abstract way of representing individual homes as part of a set. Is there a link with the rise of the mathematical discipline of statistics, with their dominant logic of the set rather than the individual? It started to appear as a way of getting a grasp of society and was adapted in the process of policy making by those in power around the same time. As life and society in general started to become more impersonal, subject to more abstract flows of goods, people, money, so did our experience of the city, and media such as photography played a role in providing frames to understand this new reality. This made me wonder about the possible capacities of locative media. On the one hand, it uses an even more abstract way of representation of place: the grid of geometric coordinates provided by the gps signal. We find ourselves always at the center of this spatial universe, with the services we require mapped around us in concentric circles. Through tracking software, statistics can be calculated in real time. They can be integrated in highly sophisticated and customisable data sets as those used in geodemographics. All our actions could easily be recorded, assembled in statistical sets, analyzed and fed back to us by means of lifestyle group labels such as ‘suburban optimists’, ‘aspiring hispanics’ or ‘hinterland families’. Will we identify with these new ways of ascribing identities, and thus expand the logic of the (data) set, yet in new ways? media no longer belong primarily to spatially bounded specialized sites such as the cinema, but are becmonig mobile and pervasive. Rather than a record of past events, digital media frequently provide instantaneous feedback in ‘real time’. Not only are social interactions routinely distributed across heterogeneous space-time frames, but mediation by complex technological systems has also become integral to social dynamics. If postcards taught us to think of the city as a fragmented discontinuous environment without a master perspective, perhaps locative media can learn us to reconciliate the abstract world of globalization with more subjective experiences of place? The problem is not simply the exposure of the previously private or the increased mediation of public space. Rather it is the all-too frequent reduction of the social uses of new media platforms to the possibilities dictated by commercial profit and loss. Failure to imagine new publics and new forms of privacy locks the relation between public and private into an unproductive structure of voyeurism and narcissism.